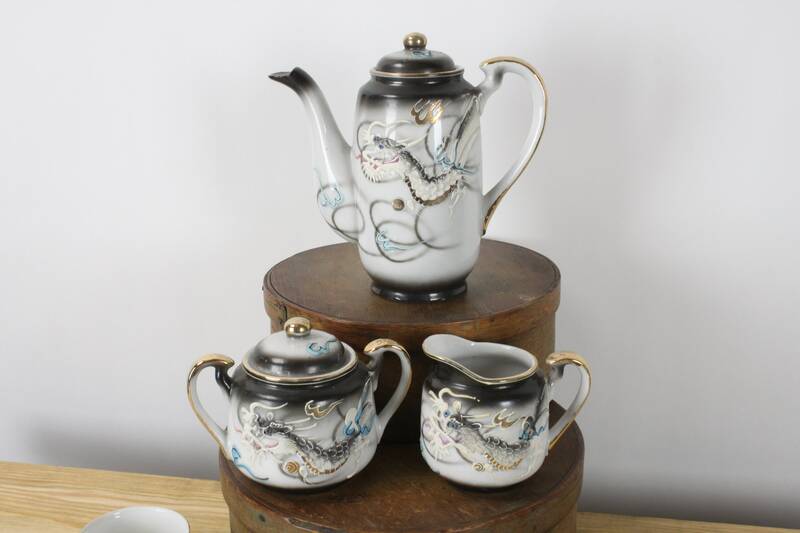 This amazing unsigned china tea/coffee set features a classic smokey dragon moriage pattern and handsome gold-glazed handles! 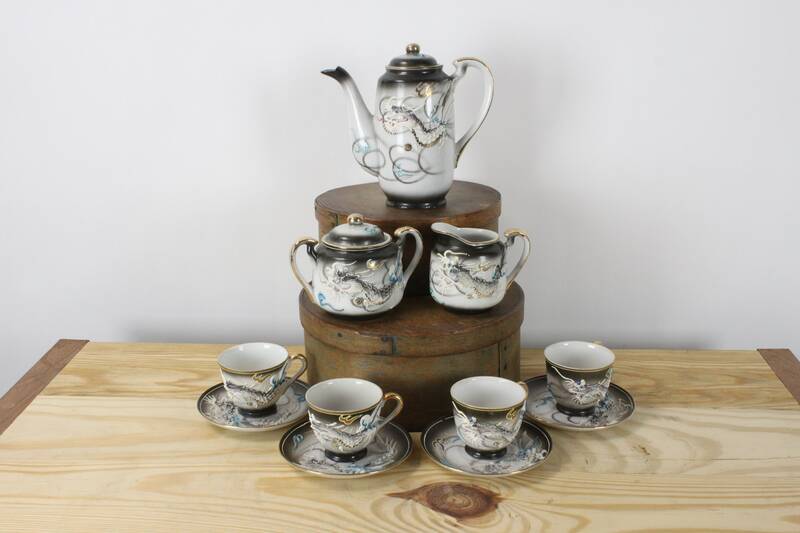 Exceedingly rare, treasured and in excellent condition: 11 Piece Set Moriage Dragonware Covered Tea/Coffee Pot with 4 Cups & 4 Saucers. 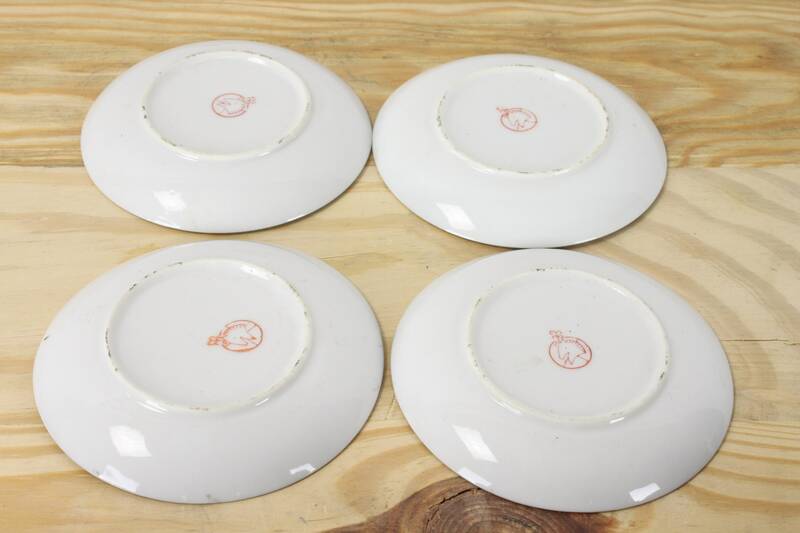 This Pre World War II set most likely dates to the late 1930s and is simply amazing. 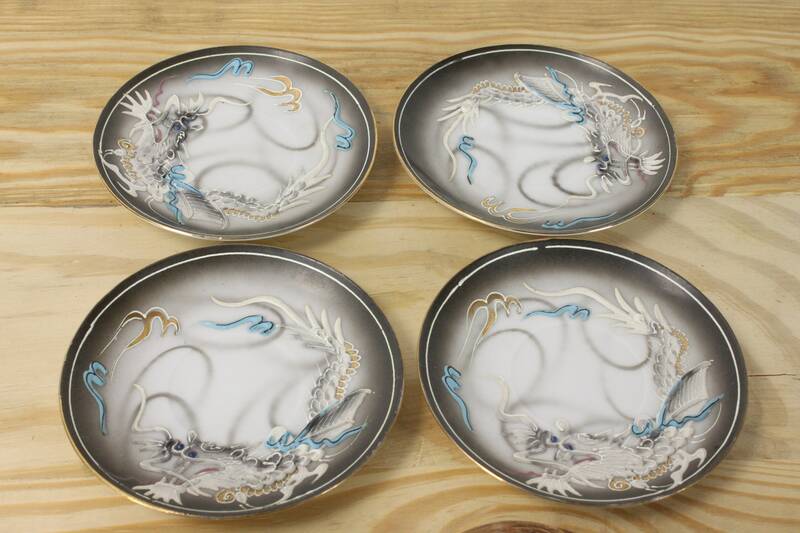 The bisque-like matte finish topped porcelain pieces feature hand painted dragons and clouds done in the Moriage style, meaning they are dimensional and actually raised above the plate. You can see and feel each edge and texture. 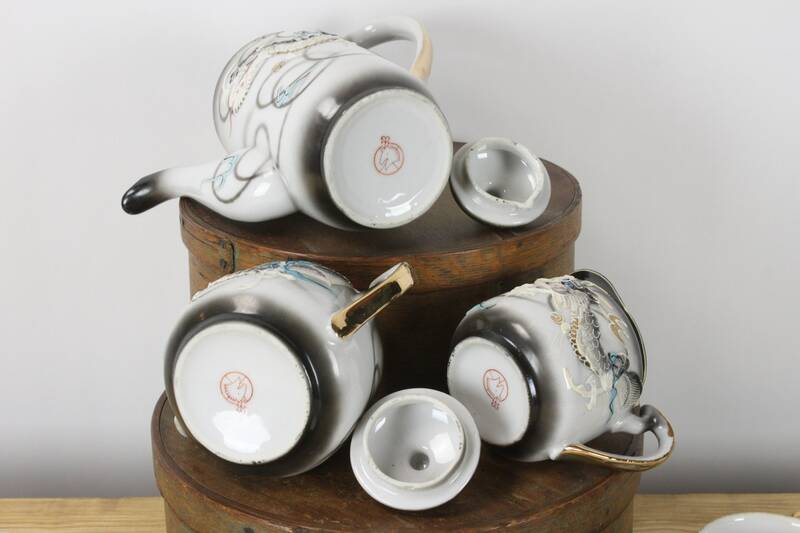 Slight variations in the glaze and decorative work are to be expected in pieces such as these, produced one at a time by human hands. 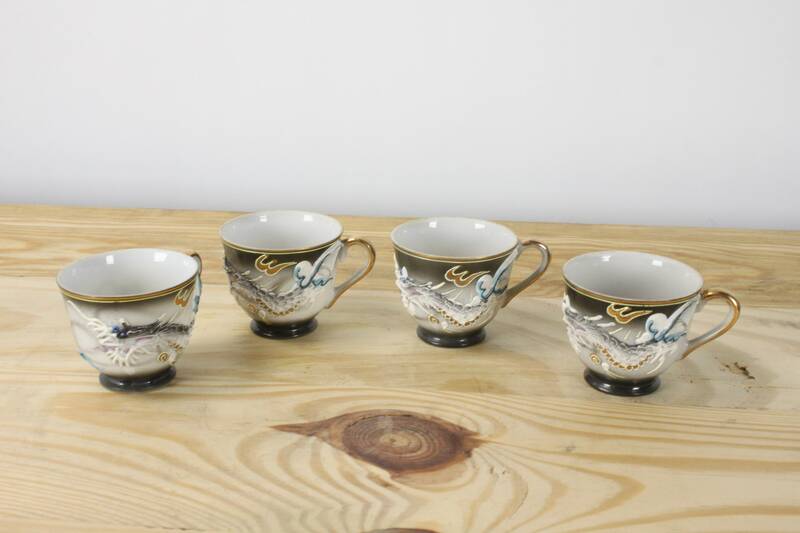 The cups, saucers and covered tea/coffee pot all feature a winged dragon with cream over black dimensional scales, wrapping halfway around a smoky black background. Each dragon has blue eyes with a black glass dot in the middle. Its tongue is raised, in squiggly streams of paint in a shiny, dusty rose pink. The dragon appears to be hissing or snarling! 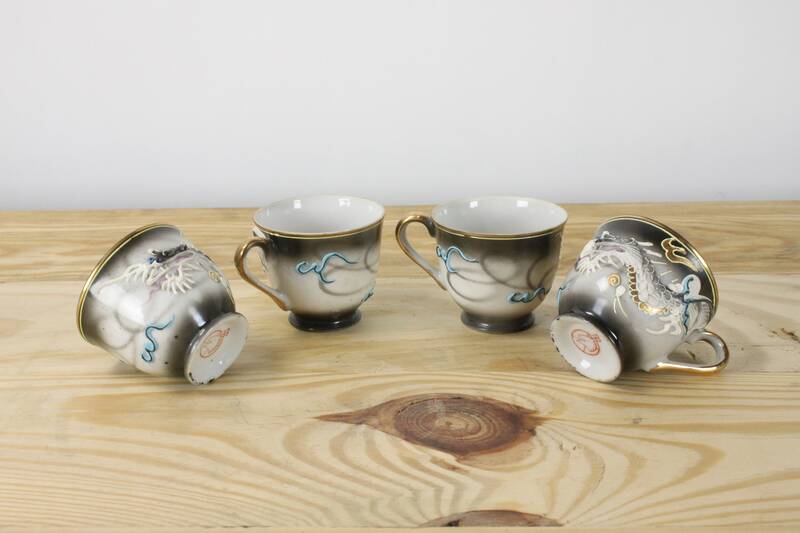 Swirling around the dragons on the pot, cups and saucers are wispy blue graffiti like shapes, also dimensional and outlined in white. Along the rim of the plate is a thin black border, edged with a wavy white line that form a visual border around the plate, also done in Moriage. 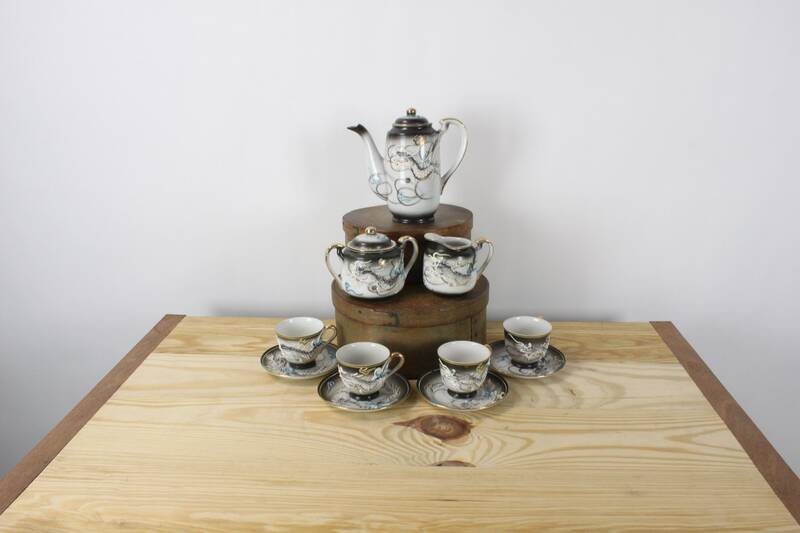 - Pot: 7.5" x 6.5" x 2.75"
- Sugar bowl: 5" x 3" x 3.75"
- Creamer: 3.75" x 2.5" x 3"
- Cups: 3.25" x 2.5" x 2.25"